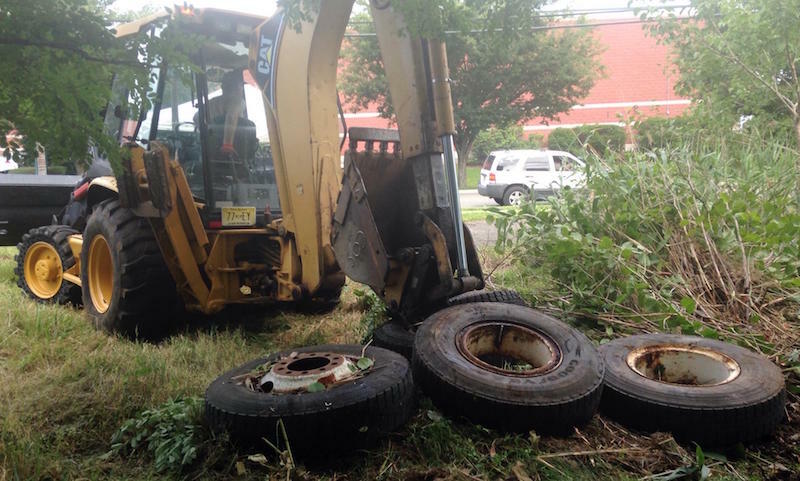 SECAUCUS, NJ- On Friday, July 15, 2016 from 10:00 a.m. – 1:00 p.m., the Secaucus Environmental Department held its first ever corporate cleanup on Penhorn Avenue. Bringing in 34 volunteers from local businesses, the team was able to remove a noticeable amount of debris from the area, including over 35 bags of garbage, close to 50 tires and a mattress. Lynn Kramer, Cleanup Coordinator for the Town of Secaucus, put together this event to encourage the employees who work on Penhorn Avenue to get involved in keeping their space clean. While Lynn and the rest of her team were apprehensive about attendance for the cleanup because of the heat, the amount of volunteers and the hard work they put in was a pleasant surprise. Seeing how willing everyone was to help out, Lynn plans on making a cleanup of Penhorn Avenue an annual event. Penhorn Avenue businesses who participated in the cleanup included: AJ Worldwide Services, Benmark Construction, Intersection, International Leather and Suede, US Crystal, Art Van Line, K-Line, Bhasin Properties, Pump It Up, Remington, Vernick & Arango, MedShare and Mega Shipping. work that was done on Friday, Lynn and her team hold several cleanups throughout the year. For more information about how you or your business can get involved, please contact Lynn Kramer at 201-330-2000, x3060.